I am moving my blog to my website www.ewian.com/blog . It is long over due. Blogger has been a good place to have a blog, but since I have my own domain and have had it since 2005, it was time to move. 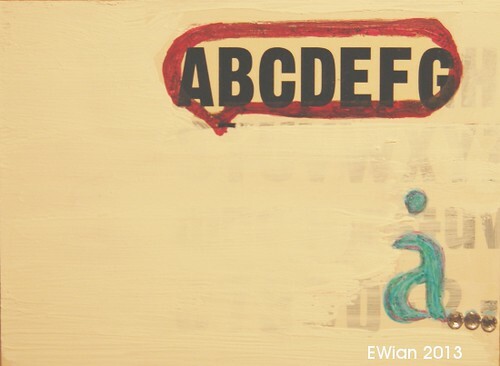 The whole ewian.com webpage is getting an overhaul. For me it has been and still is a steep learning curve. The goal was to have it done the summer of 2014, how ever, as most things, the process did uncover 10 new issues as soon as I fixed 1. So new goal is Easter time 2016. I do see the end of my to do list is getting shorter. Moving the blog is one of those things that let me post new things as well as work on revamping old stuff. Thank you so much for having the patience to stick with me. 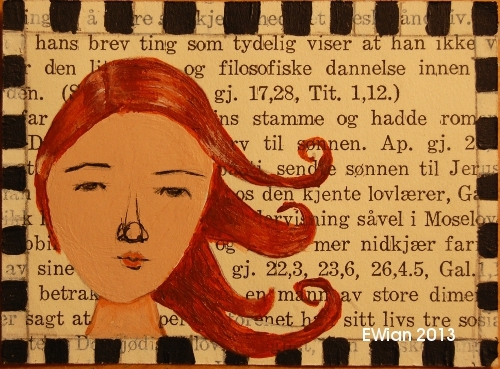 Jeg flytter bloggen min til min nettside www.ewian.com/blog . Det er langt over forfallsdato. Blogger har vært et bra sted å ha en blog, men siden jeg har mitt eget domene, og har hatt det siden 2005, det det på tide å flytte. Hele ewian.com websiden er å få en overhaling . For meg har det vært og fortsatt er en bratt læringskurve . Målet var å få det gjort sommeren 2014, men, som de fleste ting, avdekket prosessen 10 nye ting så snart jeg fikset 1. Så mitt nye mål er påsketider 2016. Jeg ser nå at listen min blir kortere og kortere. Å flytte bloggen er en av de tingene som lar meg poste nye ting, samt arbeid på oppussingen av gamle ting . Takk så mye for at du har tålmodighet til å følge med meg. It has been a long time since I've posted anything on this blog. Health was not good last year and blogging was what I sacrificed to have more energy. 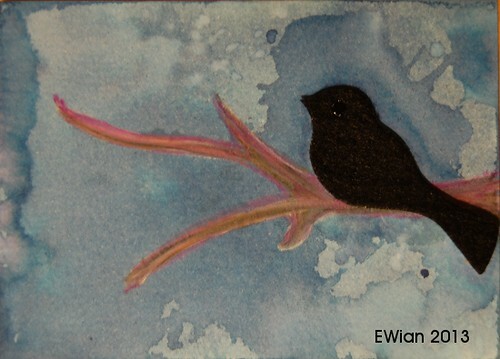 Although I have not blogged, I made lots of art and completed several projects, one of those I completed was a daily ATC - Artist Trading Cards (with the exception of the days I was in hospital and days with painkillers after). 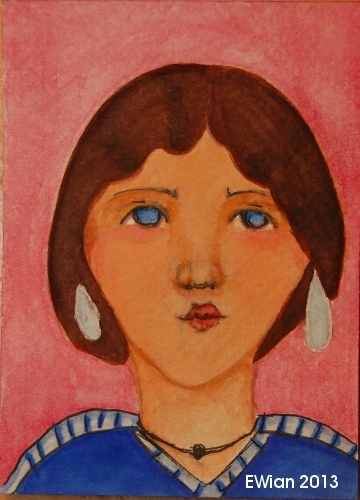 Things are better now and the plan is to back log the ATCs so that I can share the joy of the project with you. 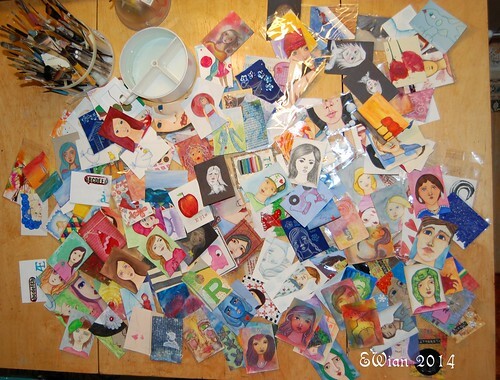 AND if you find an ATC you like, I will be happy to swap. 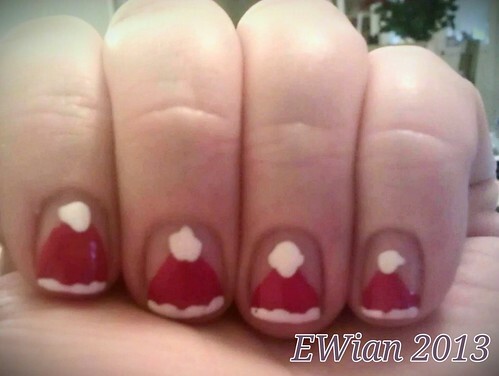 Santa's hat nails, a photo by ewian on Flickr. Some times it is all about the colour. 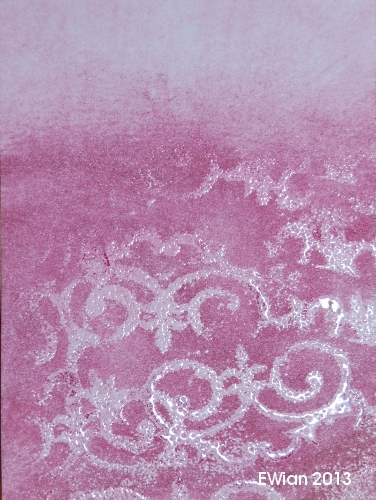 Medium used: embossing powder and ink pad. 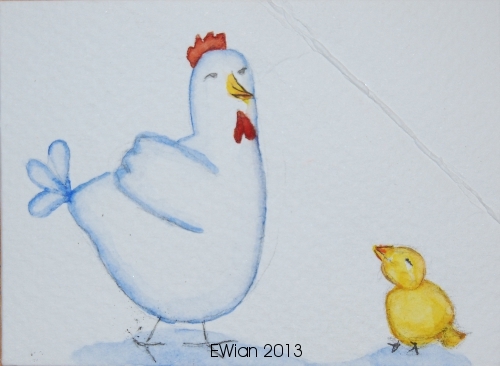 Have you ever played the game Mother hen and her chicks? It is a sweet little game to play with little children or when you want to get children to get to know each other. Medium used: watercolour and permanent marker. The first time I saw marbled yarn. 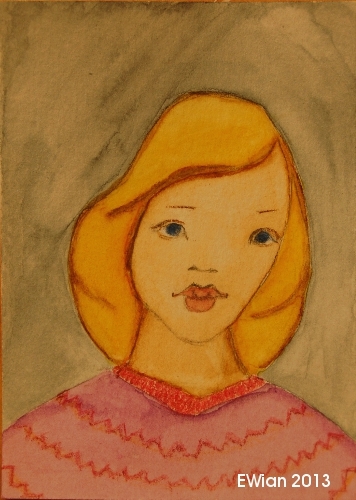 Was when my childhood friend Ingrid's mother had knitted her a pink sweater. Remember I found it fascinating. When she closed her eyes saw cotton candy balls floating in the air. Medium used: watercolour, permanent marker and gloss medium for the candy balls. Roseine is a shade of magenta and this girls name. 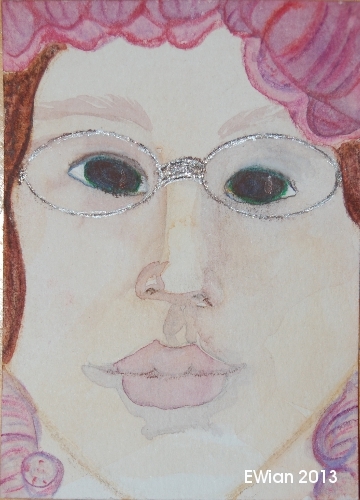 Medium used: watercolour and glitter pen for the glasses. It's super annoying to lose an earring, but this girl has managed to preserve both. This paper plane is cast to the wind. 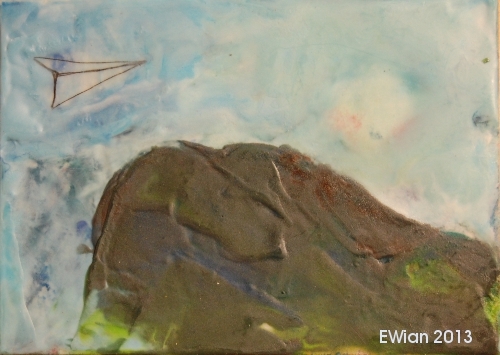 Made with the encaustic technique. 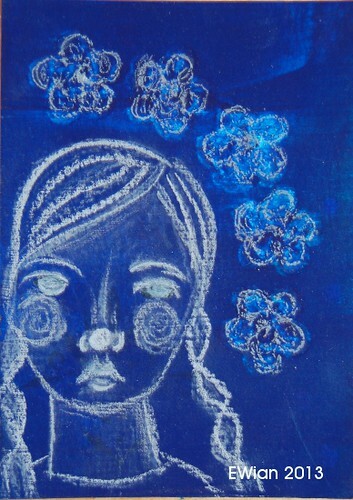 Medium used: bee wax and wax pastel. Frenchy is one of the main characters in Grease. She is one of the members of the Pink Ladies. 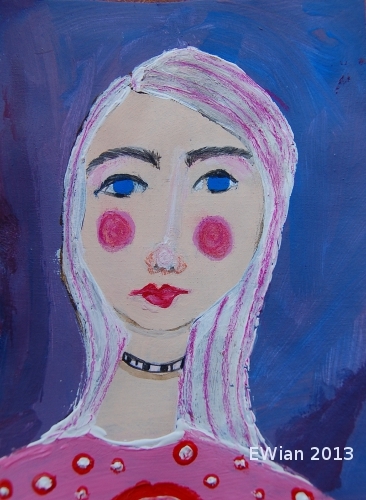 She drops out of highschool to go to beauty school, which fails and she ends up with pink hair. 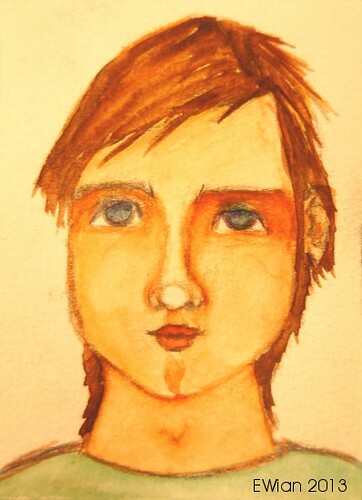 Medium used:watercolour and colouring pencil. Medium used: acrylic paint, permanent marker and colouring pencil. 21. of March mark the calendar from winter to summer, vårjevndøgn, spring equinox. So to this girl, I give her a spring dress. 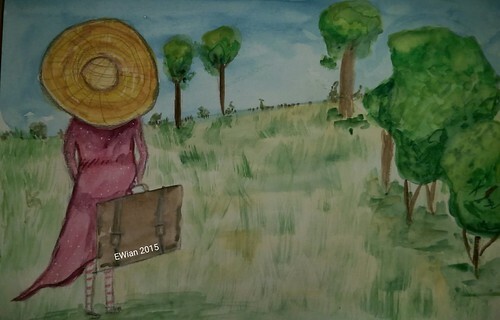 Medium used:watercolour and permanent marker. The words "clear philosophical formation" are translated from Norwegian, they are random words from the book page the ATC is made on. 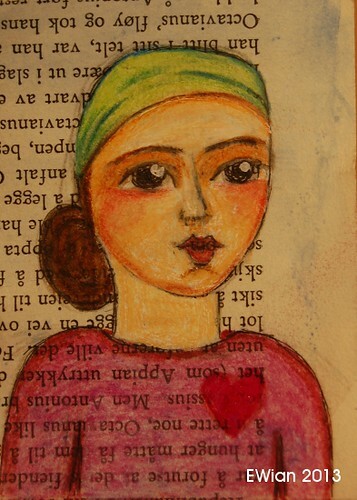 Medium used: acrylic paint and permanent marker on vintage book page. There's no flying without wings. Medium used: gel and glitter pen. Mrs. March is an eternal optimist, she plants pansies and marigolds and hopes that the summer is coming soon so she can set the flowers outside. 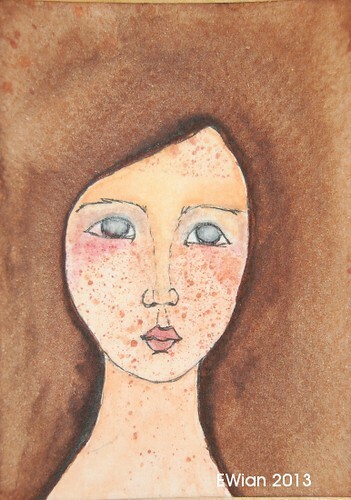 Medium used: watercolour, colouring pencil and pencil. 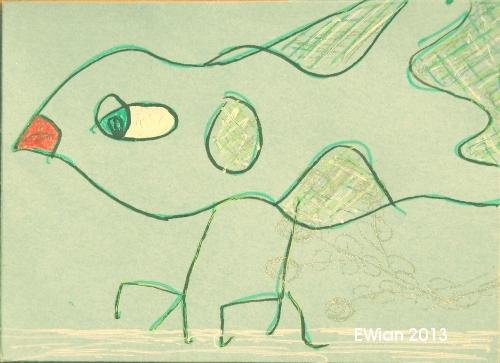 For the last three years I have been a part of iHannas spring postcard swap. 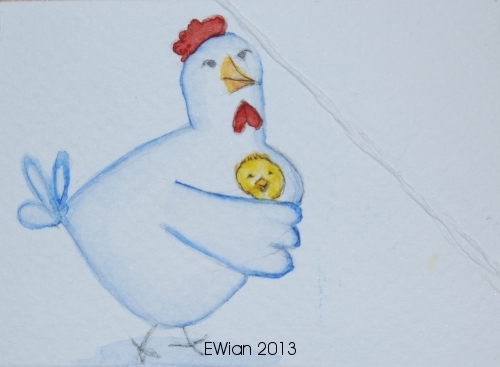 This year I am joining the iHanna postcard swap again. I have gotten some really nice card, some still hang on display in my studio, not to mention all the fun I had making the cards I sent. It is so nice "meeting" people from around the world and getting a glimpse of there life through there creativity and art. 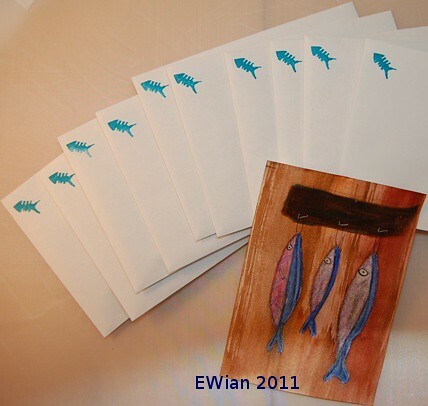 I am so looking forward to the cards that will be delivered to my mail box. I'll post them up here as I get them. Join the swap by paying the 6 dollar fee via paypal. The small fee will make people that are joining more serious and they will send out there cards. The last sign up date is 24th of March 2013. 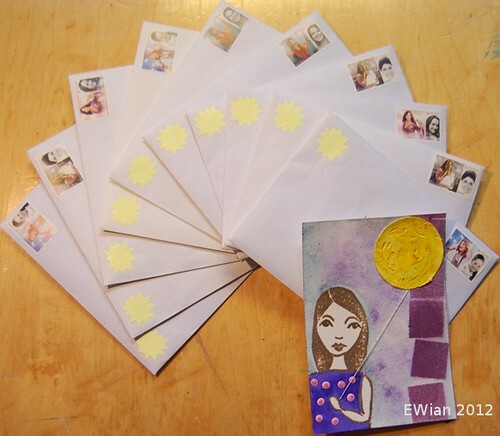 Make 10 handmade postcards any style – your choice of postcard size. Bought postcards are beautiful – but those are not welcome in this swap. 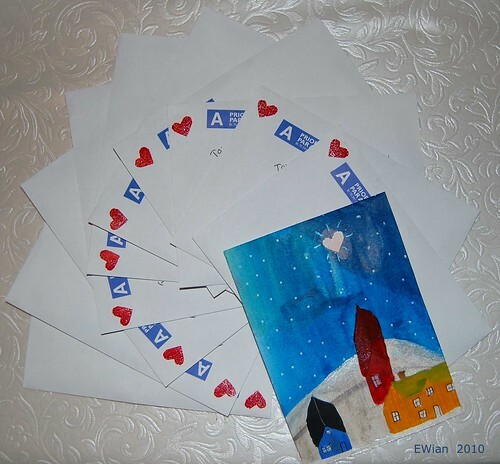 Instead try to be artistic with your cards! 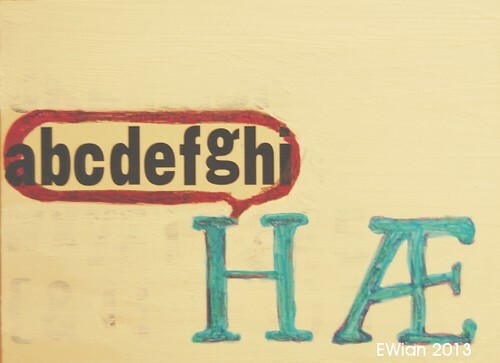 DIY actually means “Do It Yourself. The cards need to mailed no later than March 30! Would love to see your cards in the swap! 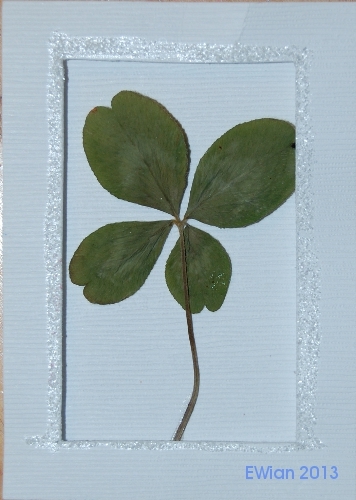 A clover with four leafs, instead of three leafs, is a common good luck symbol in many countries. To find such a clover with four leafs a sign of personal success and luck. The klover with four leafs is therefore a widespread symbol of luck and regarded as a lucky charm. Some people think that random luck is about to seeing and seizing opportunities. When I was a child, I found many such clovers with four leaves. It was perhaps most about that, as children we were out doors a lot, and with a little attention to detail one could see when there was something that stood out. 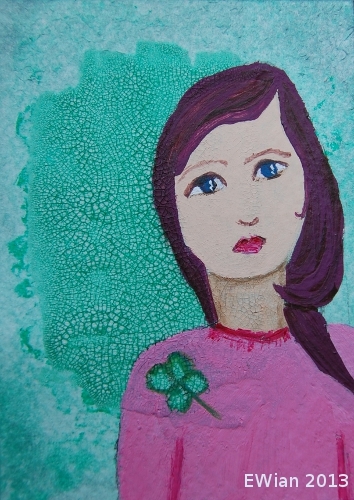 Medium used: glitter, glue and a real four leaf clover dried and pressed. Way back in the 90's I actually had green hair. My hair was bleached 3 times to knock the natural red out of it. The red did not go away, but the hair got green anyway. 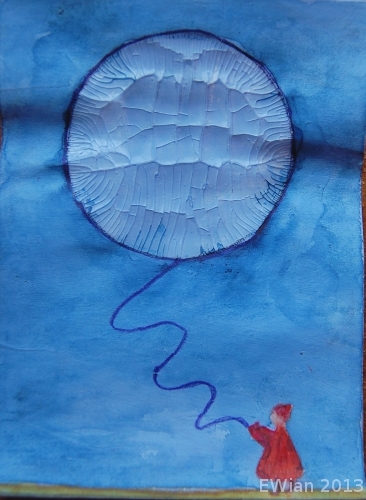 I have played around with this motive lots of time this time the moon balloon was cracked. 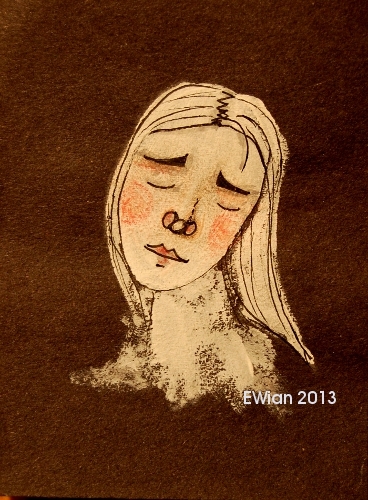 Medium used: pen, watercolour, acrylic paint, crackling paint. 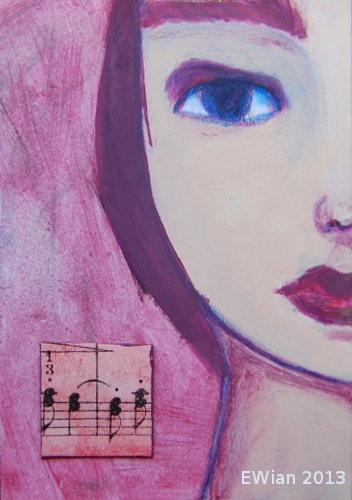 Medium used: acrylic paint, colouring pencil and collage. 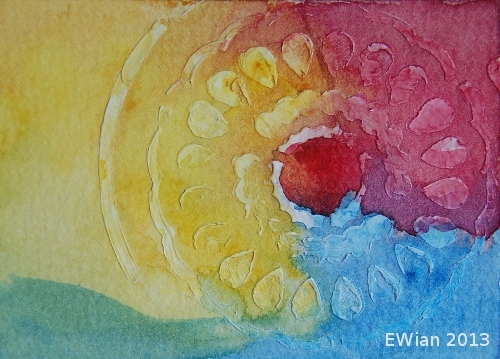 Just a simple play with modelling paste and watercolour in the colours: red, blue and yellow. 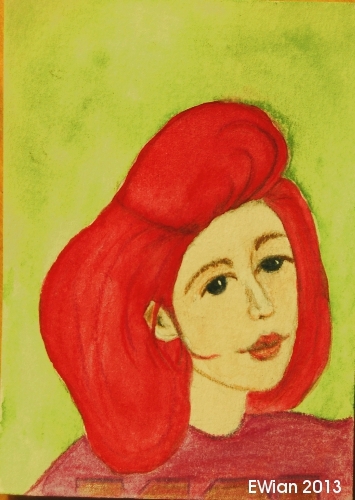 Medium used: modelling paste and watercolour. 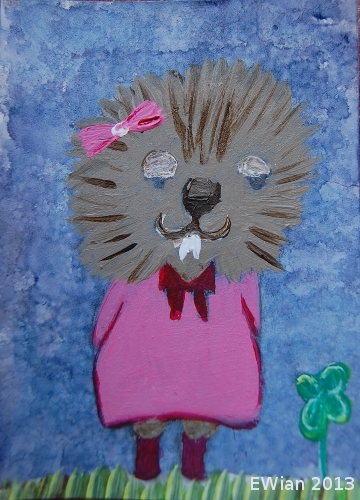 Medium used: crackling paint, acrylic paint and watercolour. 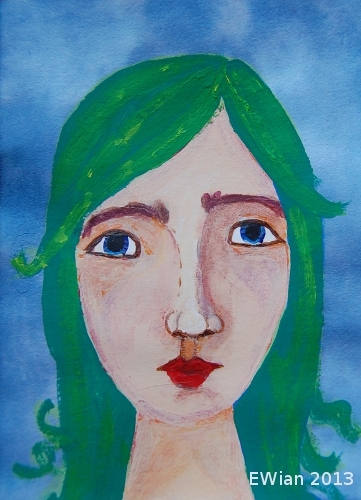 Medium used: acrylic paint and colouring pencil. The idea behind the International Women's Day was to make a strategy to promote equal rights, including suffrage, for women. Sadly after more than 100 years being a women does not give you equal rights, nor equal worth as a man. Medium used: button, ribbons, permanent marker, acrylic paint and gel pen. The sun heats so lovely, it's still cold in the shadows, but the sun promise that spring is on coming. 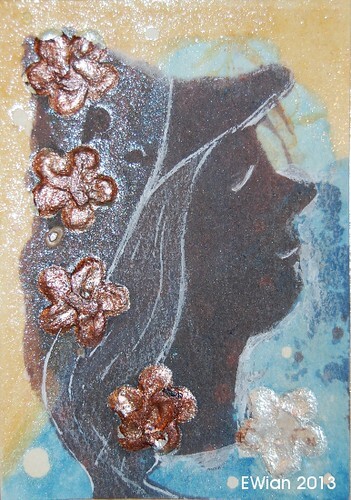 The card is a recycled test ATC I made back in 2008 for the artist group ZNE. 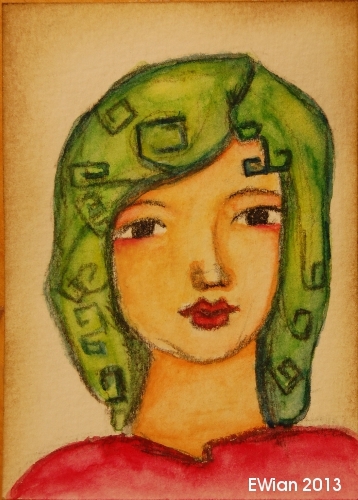 Medium used: iridescent, alcohol based ink, gel pen, watercolour, stamp. Norwegian: Solen varmer så deilig, det er fortsatt kaldt i skyggene, men løfte om at våren er på tur. Kortet er et resirkulert test ATC jeg laget tilbake i 2008 for kunstnergruppen ZNE. The first migratory birds are here. It is the Great Cormorant and the Northern Lapwing. 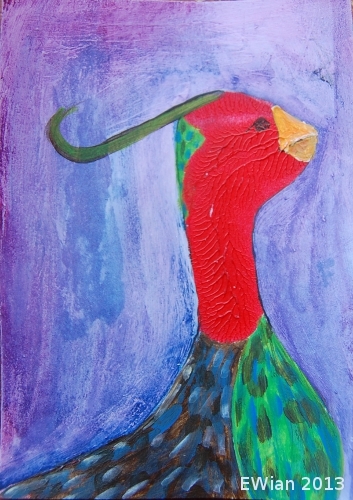 Medium used: felt bird,colouring pencil, distress stains and gloss medium for the eye. 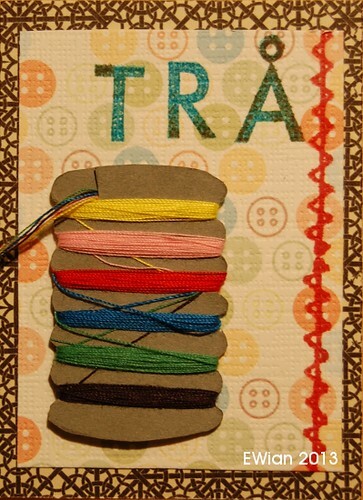 The Norwegian word for thread is "trå". Made a little spool from some left over thread, about 1 meter of each colour. Medium used: thread, pattern paper, stamp and ink pad. Just a little beatnik girl, trying on her more colourful jumper, in contrast to her sold black turtle-neck. 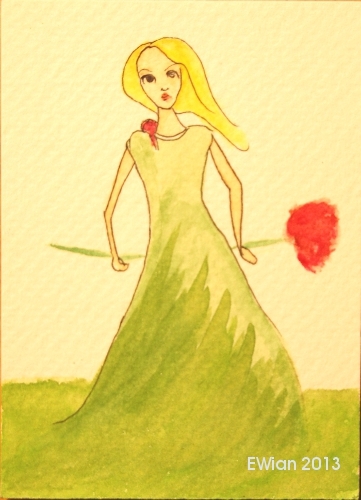 Medium used: gesso, watercolour, and gel pen for a glossy heart. 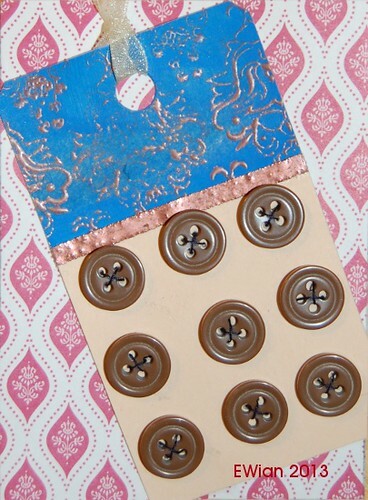 Was inspired by the old button cards, so I made ​​a tag and sewed on buttons. Medium used: buttons, paper and a bit ribbon. 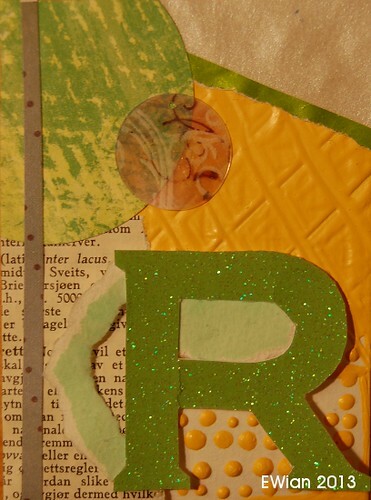 Collaging book paper, yellow and green scraps. 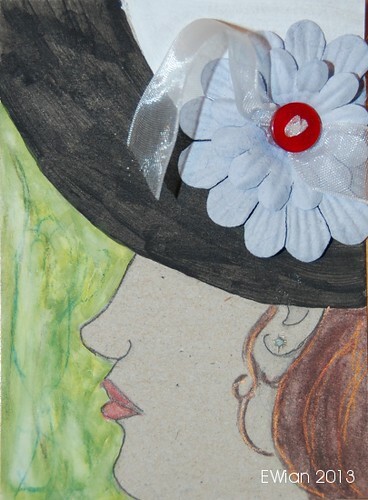 Medium used: vintage paper, pattern paper and acrylic paint. I like the quote from India Arie "When I look into the mirror and the only one there is me, every freckle on my face is where it's supposed to be." I find freckles charming don't you? Conversations follow rules of etiquette because conversations are social interactions, and therefore depend on social convention. Failure to adhere to these rules devolves, and eventually dissolves the conversation. This card is connected to card 58. 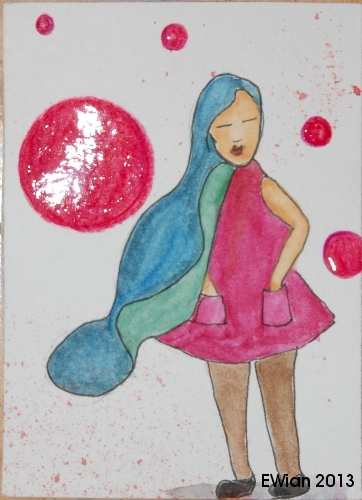 The translation on the card would be: -"ABCDEFG" -"oh"
Medium used: self made stamp, ink pad, acrylic paint and gel pen. Conversations are interactive, because contributions to a conversation are response reactions to what has previously been said. This card is connected to card 59. The translation on the card would be: -"abcdefghi" -"what"
Norwegian proverb saying "med hjertet i halsen" meaning "with my heart in my throat"
That choking feeling in the throat when you feel nervous or frightened. It refers to the way you can sometimes feel tightness in the throat when you are terrified for something. It is different from having a lump in the throat which is a positive way of being almost moved to the point of tears. 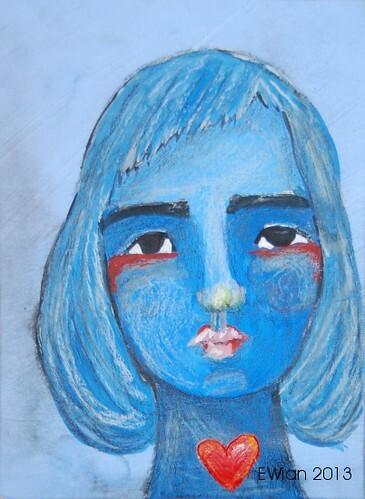 Medium used: acrylic paint and white pastel. Come to think of the rhyme about roses and violets. Medium used: vinyl paint and pastel chalk.